A grand-scale picture scroll which depicts all the process of coin minting out of copper at minting house in Akita domain. It consists of 25 different scenes, such as, copper transportation, main gate, oobukidoukatsujou, sennou, senbutai etc., and they were expressed in a lively manner. 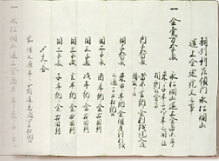 Produced when VI Kuzaemon Chisyo was the owner of Osakaya. 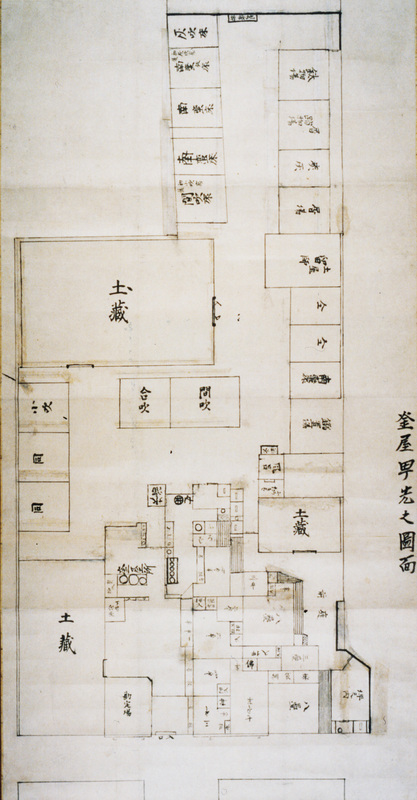 Drawing of Osakaya Kuzaemon’s main residence. 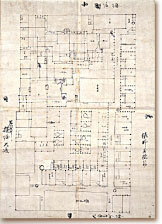 The property was 80 meters long(40 kan) in north and south, and 51 meters long(25.5 kan) in east and west. 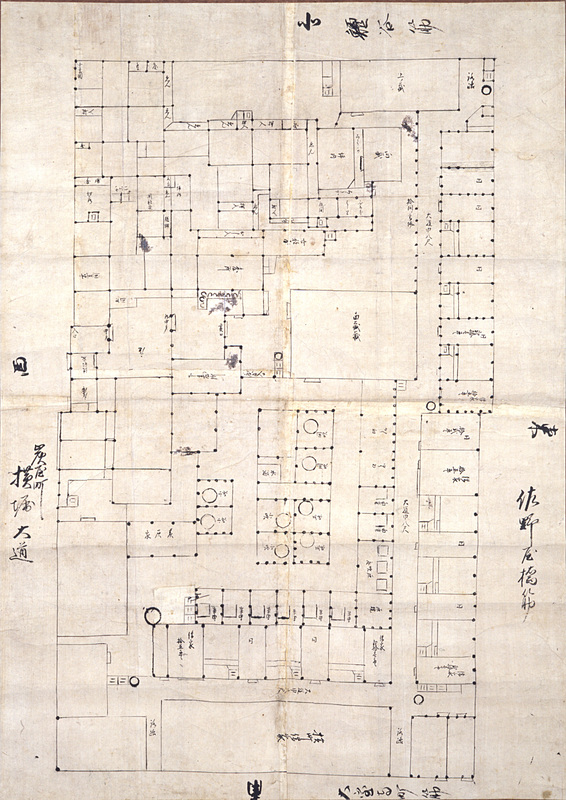 West side of the property was facing Sumiyachosuji, north side facing Unagitanisuji and south side facing Daihoujimachisuji, and the entire block where his residence was located, was his own property. Akita domain planned to extract silver from copper, using “nanbanbuki” method. Initially, Akita domain invited Hiraga Gennai as an advisor, but it didn’t succeed. Consequently, Akita domain asked Osakaya to help them in this field, which turned out to be successful. 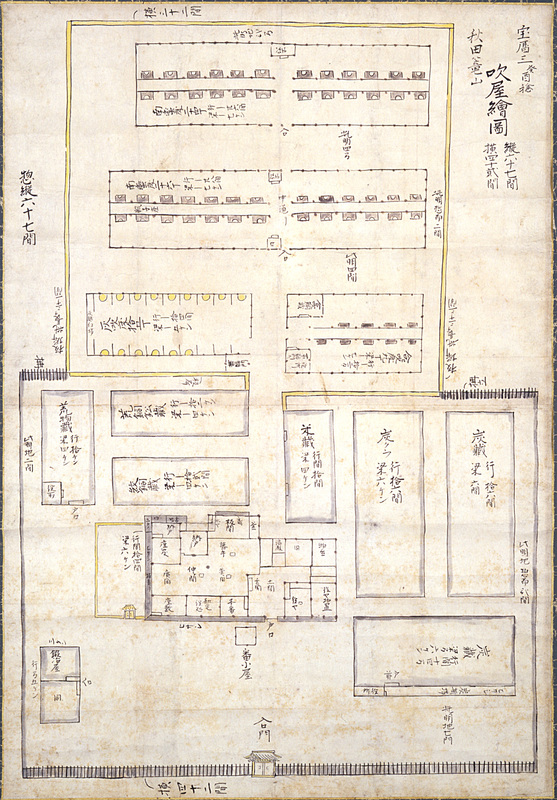 The property was 84 meters(42 kan) long in width and 134 meters(62 kan) in depth, and had 50 nanbandoko and 15 haibukidoko. Kamayacho covered the area where Dotonborigawa river and Nishiyokohorigawa river crossed. 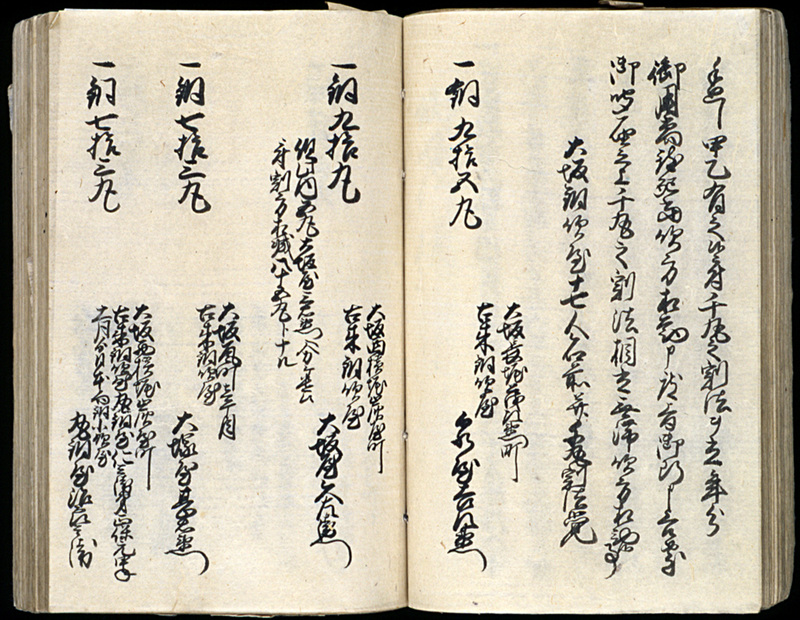 Produced when IX Komataro Seiken was the owner of Osakaya. 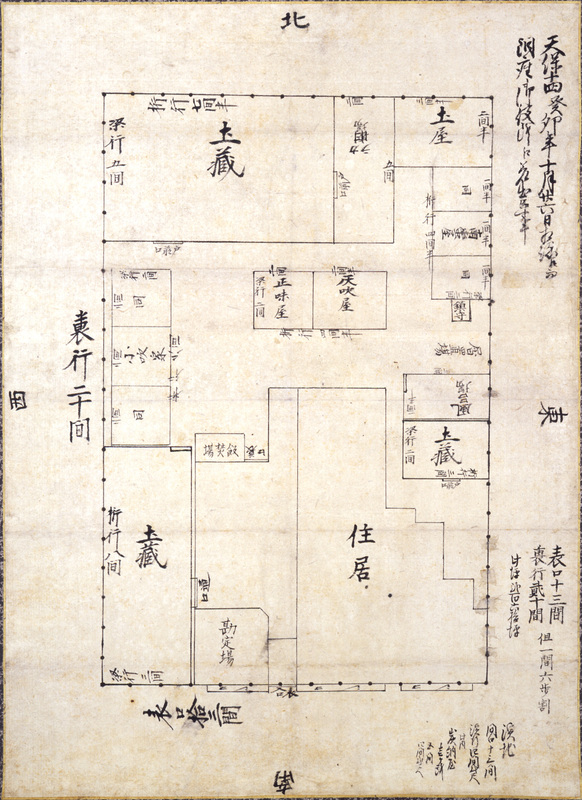 Drawing of Osakaya’s residence in Kamayacho, submitted to “dozayakusho”. 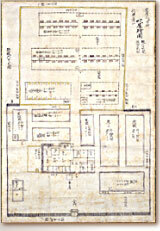 Document which summarizes the background and history of copper smelting industry in Osaka. Photos of Izumiya(Sumitomo) Kichizaemon and Osakaya Kuzaemon, among others, were provided as traditional smelers. 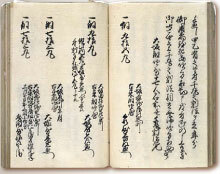 Account book which states the number of smelted copper. 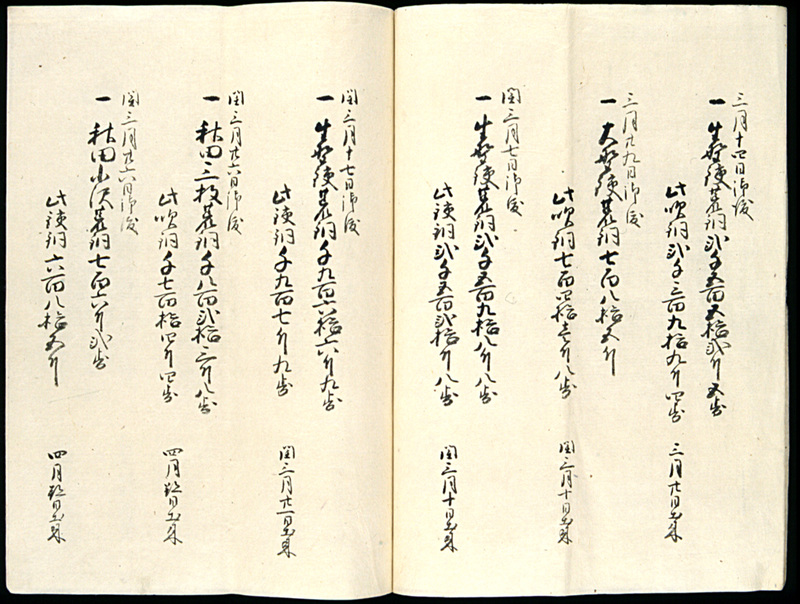 Copper ores were sent from nationwide mines, such as Nagamatsu (Yamagata), Ikuno(Hyogo), Meien (Hyogo) and this book shows those ores were smelted at which mines, date of the shipment and date of the smelting works. 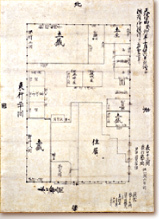 Produced when VII Kuzaemon Seihu was the owner of Osakaya. This is the contract in which Osakaya promises to pay the tax of 15000 ryo for 6 years on management of Nagamatsu dozan(copper mine), owned by Shinjo domain of Dewa province. Osakaya concluded a contract with nationwide domains and managed copper mines. 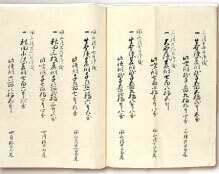 Produced when VI Kuzaemon Chisyo was the owner of Osakaya.